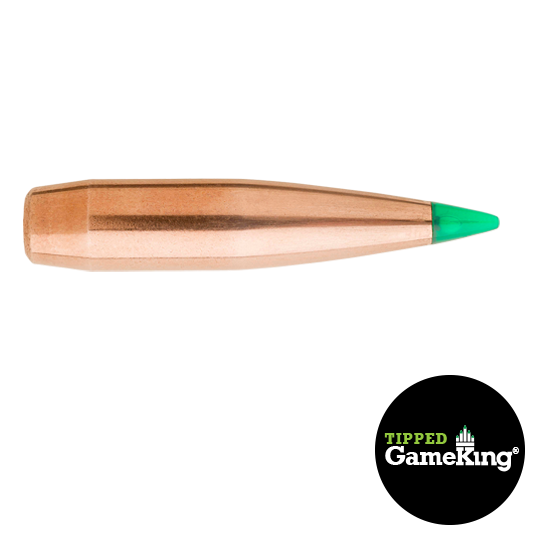 Sierra Gamechanger hunting bullets are tipped GameKing bullets the combine extraordinary Ballistic Coeffiecients and Accuracy. To create this bullet Sierra had to re-engineer their legenary MatchKing bullet by adding a synthetic transparent tip that ensures smooth chambering and a hollow point design for quick expansion. They are perfect for hunting wild game due to the improved aeroballistic flight and instant expansion on impact. The Sierra Gamechanger jacket is made of a special lead allot surrounded by tough copper to control expansion and retain weight while the boat tail design ensures stability during flight for optimal accuracy. American Rifleman tested out the Sierra Gamechanger bullets, see their results here. The GameChanger’s jacket is made of gilding metal, comprised of 95 percent copper and 5 percent zinc. Jackets are 0.001” thicker on each side than jackets on MatchKing bullets. Lead cores are not bonded to jackets. On contact with game, the polymer tip smashes back into an open pocket to instantly expand the lead core and peel back the jacket. Of course, GameChangers wear a boat tail. Sierra popularized the boat tail bullet decades ago with its reduced base drag that increases ballistic coefficient and lowers sensitivity to crosswinds, retaining more velocity for a flatter trajectory. “Boat tail bullets are highly accurate and the way we go at Sierra,” Marshall said.